“Overall, with our efforts to debunk myths, and present home fire sprinklers as a consumer-based movement, I think we can be successful in Alaska in promoting the use of fire sprinklers in the home,” says Fairbanks (Alaska) Deputy Fire Marshal Kyle A. Green. 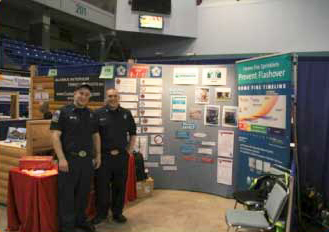 With funding through the Alaska Department of Fire and Life Safety, Green teamed up with other area fire personnel to staff a home fire safety exhibit at the 2013 Interior Alaska Builder’s Association Home Show. He reached out to the nonprofit Home Fire Sprinkler Coalition (HFSC) to borrow a display banner for the booth that illustrates the danger of flashover and the power of home fire sprinklers. He also used a laptop to present HFSC’s Built for Life game, drawing consumers, builders and real estate professionals to the booth with entertaining education. “There were some pretty tough people with tough questions, but most of the questions were centered around false information they had ‘learned’ from somewhere else,” Green says. Homeowners were most receptive to the sprinkler information and during the show, the fire service personnel signed up 82 civilians who requested home fire safety visits and smoke alarm installations. Green says the Fairbanks Fire Department will continue to utilize partnerships in order to conduct this type of effective and motivating consumer home fire safety outreach as part of its community risk reduction efforts. Using national data is an effective way to communicate the need for fire prevention programs but data can be even stronger when localized for your community. This was done by Richard Taylor from the Office of the State Fire Marshal in Maine. The following section describes how to gather and localize the data for use in your community. A series of templates that can be personalized with local data was developed by Richard Taylor,* Communications and Research Manager for the Maine State Housing Authority. They demonstrate how fire data can be presented in different forms that illustrate a community’s fire picture, fire department responses, costs of fires and benefits of prevention. By tailoring these templates, any fire department can localize the statistics of fire’s impact in their service areas. Instruction below will help you localize data for your own community, either through these templates or other means. Localizing the impact of fire helps leaders connect with the problem. It also can impress community leaders with the hidden costs of fires. Demonstrating the actual cost of fire to your community can help build interest and support for fire prevention programs. Use the Fire Prevention Data Localization Templates to gather and organize demographic and fire incidence data for your community. You will find instructions for using the templates on the first page of the file. *Richard Taylor is the Communications and Research Manager for the Maine State Housing Authority. Prior to that he was the Senior Research and Planning Analyst with the Maine Fire Marshal’s Office. Richard has a B.A. in History and Philosophy from Bradley University; an M.A. in U.S Constitutional History from Minnesota State University; and an M.A. in Public Policy Management and Analysis from the University of Southern Maine. Jim Crawford,† in his article “Building Blocks of Advocacy,”* quotes his friend Wayne Powell as saying, “No data, no problem; no problem, no money.” As this quote underscores, meaningful data is indeed essential. But injury and death statistics alone will not generate the type of support needed for effective prevention programs. In order to generate support as well as active advocacy among community leaders, you need to show the full impact of fire on an ongoing, year-to-year basis that includes costs to the economy, the social structure, community viability and the environment. This was done very effectively as part of the Vancouver, Washington, advocate development program. Despite these and other efforts, the Vancouver Fire Department budget was still cut, as were emergency operations budgets. This underscores the importance of ongoing, nimble efforts to demonstrate the true costs of fire on the entire community. 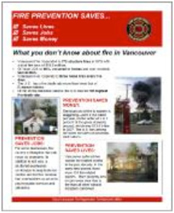 The prevention committee created a PDF fact sheet to demonstrate the real cost of fire to the community, beyond the statistics people tend to think of first. †Jim Crawford is the former deputy chief and fire marshal with the Vancouver (Washington) Fire Department. He is a member and past chair of the National Fire Protection Association (NFPA) technical committee on professional qualifications for fire marshals. He has written “Fire Prevention Organization and Management,” published by Brady, and has also written a chapter on fire prevention in “Managing Fire and Rescue Services,” published by the International City/County Managers Association. Crawford is a past president of the International Fire Marshals Association and has served on the NFPA’s Standards Council. He is a fellow in the Institution of Fire Engineers U.S. Branch, and a member of the International Association of Fire Chiefs. 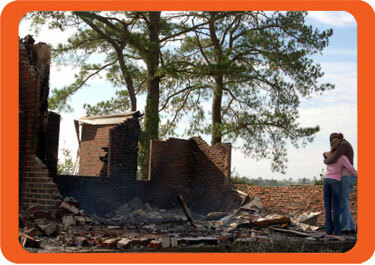 The United States Fire Administration offers a free Fire Data Analysis Handbook in PDF format. Use the Fire Prevention Data Localization Templates to gather and organize demographic and fire incidence data for your community. You will find instructions for using the templates on the first page of the PDF file. 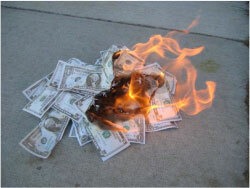 *This is the total fire dollar loss shown on your NFIRS “Summary by Fire Incident Type” Summary Output Report found in your NFIRS Web-based tools.